STORY - A Forest Tale 10: Crisis. I recognized the youthful voices of Quickpaw and Miktar chorusing their greeting and I prised an eyelid open to survey the situation. All five of us had fallen asleep on the rugs in the living room and spent the night there. I found myself in the embrace of Garrek and didn't feel particularly inclined to change that, but it was time to get stirring. I rolled over and found that Kris had been snuggled cosily between Midnight and myself, our fur acting as his blanket. That left just Trina coiled into fluffy, white ball of long fur, acting as a pillow for Midnight's head. "And a good morning to you too," I replied. "No need to stand there just grinning at us, is there any particular reason for waking us now?" Quickpaw said, "Eudora woke earlier and I fed hir, but now the twins are stirring." Midnight surged to hir feet. "It's my turn to feed them. Get breakfast going; I've got quite an appetite!" As shi headed for the nursery, Jaleth emerged. "Hello there, sleepyheads! Did you have a late night?" she asked with an innocent expression. "You could say that," I grinned as I replied. "Where's Goldfur? Is shi with Malena?" "Yes. Last night they declared themselves as mates and they celebrated that in the privacy of Malena's room." Jaleth smiled happily. "My daughter has brought herself to ask Goldfur at last, has she? I've been watching her for the past year and I knew how she felt about Goldfur. It was quite a strange feeling for me to come to terms with the possibility of this three-sided relationship, but the more I watched it grow, the more I realized how well-suited they were for each other. Of course, the last two to be convinced of this were probably the couple in question." I laughed. "You got that right! Goldfur was a little stunned by how everyone, including Garrek, so readily accepted the turn of events." "Well, I'm proud of the choice my two cubs have made. It is definitely a very different family than this village is used to, but I feel that it is going to be a very successful and loving one." She paused to sniff the aroma coming from the kitchen. "Smells like breakfast is almost ready. Time to give the lovers a call." "I'll do that." I padded into Malena's room and found the two nested together, still fast asleep. I leant over and gave my sister a wake-up lick to hir muzzle. As shi stirred, I said, "Time to get up, sister. You and your new mate's presence is requested for breakfast." "Did someone say breakfast?" Malena's head had shot up at the mention of the word. "I'm starving!" "Work up a bit of an appetite, did we?" I grinned. "We certainly tried our best!" She grinned at Goldfur who lovingly stroked her head and rubbed hir muzzle against hers. Breakfast turned into a celebration for the two and Malena was startled by the degree of support that her parents showed for her decision. I told her that it was because they had the time to get used to the possibility. Like most children, she didn't realize just how much her parents already knew. We made our preparations for the day's events. I loaded my twins into the backpack, but Eudora was proving to be restless and unwilling to be carried. "Why don't you leave Eudora with me?" Jaleth volunteered. "I need to look after my own cub for a while and get a couple of chores done first. I'd like to be able to spend a bit of time with my granddaughter too. You can come back a little later and collect hir." "Thanks, Jaleth." Goldfur gave her a quick hug and we were on our way. Miktar and Quickpaw took off to find their friends while the rest of us went to check out the activities planned for the day's competitions. We were going to see whether anyone could use help with setting up and perhaps get into one of the earlier games, but first we had to deal with someone else. "Time for our daily dose of misery, folks," I announced, having spotted Ketta ahead. She had apparently seen our group and had stopped to wait for us to reach her. I was determined that she wasn't going to spoil our fun today. "Good morning, Ketta. Are you going to be competing in the games today?" "Don't act so chummy with me; I'm not your friend. I don't see the brat. Have you finally decided to stop shoving it in our faces?" Goldfur answered, "Shi's spending some time with hir grandparents. My daughter is a fact of life; get used to it!" "The only fact that I know is that you are an outsider who has no right to be here." It was Malena who leapt to hir defense. "No, Ketta. Goldfur is welcome in our village both as a friend to our clan and as my brother's mate, but you have been harping on the fact that it should be vixen's choice. Well now it is for sure. I have asked Goldfur to be my mate too and shi has accepted. Now you don't have any excuse." Ketta was stunned speechless. She had been using rationalizations as her reasons for her attitude towards chakats, but now that her most important excuse had been bypassed, she was left sputtering, trying to come up with another reason to cover up her own bigotry. Unable to come up with a retort at that time, she whirled and stalked off in a rage. A little sadly, we continued on our way. "Does anyone know why Ketta hates us so," I asked. Garrek replied, "It's probably a lot to do with me. You know how she said that some vixens had their eyes on me before I went away? The truth is that there was one and that was Ketta. However, she was never forthright with me about it. Instead, she was stringing me along and, as it turns out, several other tods. She wanted me all right, but purely on her terms. There was no love in her attentions and fortunately I realized that fact in time. It put me off vixens for a while and certainly didn't help my shyness. Meeting Goldfur was the best possible thing to happen to me after that. Shi was my beautiful lady and shi wasn't a conniving vixen. Ketta, however, is not the type who takes losing graciously and still wants her petty victories. Chakats in general and Goldfur in particular are the enemy as far as she's concerned. I'm afraid that no amount of rational discussion will ever change her." "Thank you, Red. At last I have some understanding of what drives her. I just wonder what life in this village will be like if Ketta continues her vendetta against us." I sighed. "You'd think that after humans had finally almost eliminated bigotry, we morph species would be able to avoid it. It seems that some still need to learn that lesson." "Oh stop being so maudlin," Midnight chided me. "One foxtaur can't spoil the whole day. Come on, I want to get over to the archery field." I grinned back at hir. "You're right, of course. Time to have some fun!" We ended up splitting into groups to follow different activities. We left Midnight and Trina talking with Dilenna, quite sure that they would be pre-occupied for some time. Goldfur, Garrek, Malena, Kris and myself joined up with a volleyball team for while. The game was a lot of fun, but Goldfur said shi couldn't stay too long as shi would have to go fetch Eudora. The game wasn't quite finished though when Rikandor came running up to us and skidded to a stop. "Come quickly! Eudora's gone missing!" I barely caught a glimpse of Goldfur's expression of panic before shi took off like a furry bullet. The rest of us took off after hir while Rikandor informed us that Jaleth was notifying the authorities. We arrived well behind Goldfur to find hir and Jaleth together. The vixen was explaining, "I was only in the next room a few minutes, getting some things together to take to the fair. When I came back in, shi was gone." Goldfur started examining the room, opening all hir senses to find a clue. I cautioned everyone else to keep back, then joined hir. Suddenly Goldfur hissed, then spat out one word: "Ketta!" I checked for myself and verified it. Ketta's scent was definitely there. Fear gripped at me. What had that mad vixen done? She had no idea what she was unleashing. Goldfur's eyes were lit with rage and shi snarled as shi raced out of the room. "Garrek!" I commanded, "Follow hir! No time for explanations, just try to keep hir out of trouble." He took off after hir without question. "Malena, go get Midnight. Shi's our best tracker." Malena was gone like a shot. "Kris, get our comms and your kit and meet us outside." As usual, Kris was already on it as I said it. He was always prepared for emergencies, no matter how unforeseen. "Jaleth, Rik said that you were contacting the authorities. What's happening?" "The town guard was going to send over a couple of people to look for what they believed was a lost cub," she replied. "I'll go tell them that this is now a kidnapping." "Do that, and tell them that time is of the essence. There's more at stake than you know." She hastened to comply. "Alert the medics too," I called out an after-thought. "Rikandor, please come with me. We are going to start searching and let everyone else catch up to us." I ran outside and cast about for a scent. "Are you going to track Ketta like the missing cubs last year?" Rikandor asked. "That's the idea. Goldfur will be doing the same, but shi will be too overcome by hir emotions to do so efficiently. It's important that we get to Ketta before shi does. Come on, this way!" Ketta's trail led back to the well-traveled lane that led to that grouping of homes and was overwhelmed. Perhaps a bloodhound's nose might have been able to sort it out, but at least we had one trick that they couldn't match. Just then, I saw Midnight approaching at top speed. Shi came to a halt next to us, panting, "Malena says Ketta's got Eudora?" "That's right. I found her trail coming from the house and it gets lost here on the lane. We're going to have to do a full scan of the area." "Right. She'd be unlikely to head towards the village with the cub, so I suggest you go further down the lane and try to get a bearing on her from there." By this time, Kris had emerged from the house with our comms and Midnight and I grabbed ours, then I trotted down the lane. Meanwhile, Midnight sat on hir haunches and relaxed and opened up hir senses fully in the way that no one but another chakat could match; hir senses sifting the minutest clue from scenery. Fifty meters away, I stopped and did the same. Fragments of scents, tiny movements, nearly inaudible sounds, all built up a picture within my mind. "I've got her!" Midnight called. "North by northwest!" I focused on that area and finally caught an indication to get my own bearing. They weren't too far away yet. I trotted back in Midnight's direction. Shi, Rikandor, Malena and Jaleth met me halfway. "Is there any trail headed in that direction?" I asked the foxtaurs. "There's a path that goes along the cliffs and down to the valley. It's mainly used by the hunting parties. It starts over there." Rikandor indicated one of the side lanes. "Jaleth, send everyone after us as fast as possible. The rest of you come with us." Rikandor led the way to the trail with the rest of us close behind. It wasn't long before we could pick up the scent to confirm that we were on the right track. We pushed ourselves to the limit. Ketta didn't have too much of a start on us, but we couldn't tell how fast she was traveling and every moment increased the danger. We had left Kris behind and were feeling the strain ourselves when we caught up to Ketta. It was an unfortunate place to meet because the trail ran along a steep drop down one side. 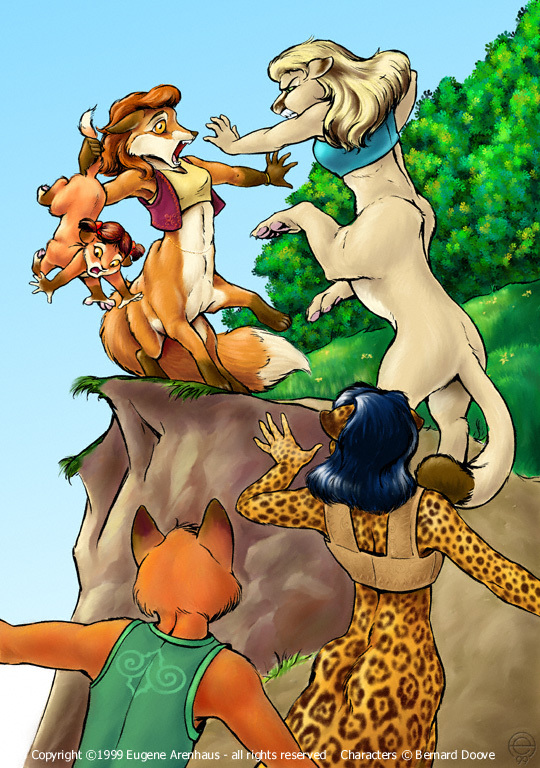 The vixen whirled about at our approach, then grabbed Eudora's tail and held hir over the edge. "Get back or I'll drop it!" she warned. "Ketta, you've got to give Eudora back now. You don't realize just how much trouble you're in. My sister will be here soon and the cub must be safe." I was going to explain why it was so urgent that she comply immediately, but she cut me off. "Forget it. Once I get rid of this freak, maybe the rest of the village will come to its senses. Meanwhile, it's my insurance." "That's crazy! The people aren't going to let you get away with killing a cub. What's more, you are in more danger than shi anyway." "Ha! What are you going to do? You couldn't get to me before I drop the brat anyway. Then we'll see who is right," she smirked. Just then, my comm beeped. Kris' voice spoke urgently, "Forest! Goldfur just passed me like a bat out of hell. Have you got Eudora yet?" I didn't have the time to answer him. Instead I tried one last time to warn Ketta. "You're almost out of time. You must give hir to me now! If Eudora isn't safe when Goldfur gets here, we can't be held responsible for your own safety." "Who do you think you are kidding? You chakats are always preaching love and peace. You wouldn't lift a finger to harm me. No, I think I'll just leave this freak dangling a bit longer. My arm is getting a bit tired though and the brat's mewlings are beginning to annoy me. Maybe I'll just get this over with right now and then we'll..."
Ketta was cut off by a scream akin to that of an enraged mountain lion. "Too late," I whispered to myself. The vixen's eyes locked on the source of the sound behind me and widened in sudden terror. Faster than anyone would think possible, Goldfur closed the distance between them. A paw blurred through the air and Ketta was sent flying to land unmoving in a nearby bush. Goldfur's swing spun hir body around; shi planted hir feet and hir prehensile tail snatched Eudora from mid air, barely having fallen at all from the moment that shi had dropped from the vixen's grasp. Goldfur swung hir tail forward to grasp the cub in hir arms, then retreated to a safe point away from everybody, still snarling in warning to anybody who might come near. Garrek had arrived moments after Goldfur, badly winded from trying to keep up with hir all this time. I grabbed him by the shoulder to get his attention. "Garrek, go to Goldfur. Reassure hir and calm hir down. You're one of the few who can approach hir safely at this moment." He nodded and slowly walked up to his mate's side. Shi emitted a short growl of warning then, recognizing him, allowed him to come close enough to put his arm around hir. He began murmuring to hir, soothing hir fears. "Everybody else keep away from them for now until Goldfur is completely calmed down." I then went over to see to Ketta. Long gouges in her fur from neck to cheek were oozing blood. She was still breathing, thank Heaven, but she was probably badly concussed. I grabbed my comm. "Kris! Where are you? "Right behind you, love." I jumped slightly. I hadn't been paying attention and had missed his arrival. "Let me through and I'll attend to Ketta." He brought out his kit and started his first aid. Since Garrek had joined our family, Kris had studied foxtaur physiology to extend his already competent paramedical capabilities, so Ketta was in good hands until more help arrived. The situation under control for the moment, I turned my attention to the others in our party. Rikandor said, "I've got word over my comm. Both the medics and the authorities will be here soon." "Good," I replied, then noticed that Malena was looking somewhat stunned. I put my hand gently on her shoulder. "Are you all right?" She looked at me, then shook herself a bit then said, "I'll be okay. I'm just a bit surprised at what happened. I mean, I don't blame Goldfur for wanting to get back hir cub so badly, but the savagery of the encounter was far above what I expected of a chakat." I sighed, then said, "You have just learned in the worst way of a flaw in our nature. Much is often said about how we care for all and love our mates and family enormously, but this is a trait that is almost too strong. When it comes to our cubs, the urge to love and protect is almost overwhelming, and in times of extreme stress, we can revert to our raw primal instincts. Under these conditions, there is no reasoning with a chakat. If Ketta had released Eudora before Goldfur arrived, nothing would have happened. However, the moment that Goldfur saw Eudora in peril, nothing would stop hir from getting to hir cub. Ketta didn't stand a chance." I looked over to where my sister was lying, hugging Eudora to hir breast. Garrek had managed to calm hir down by now and shi had started suffering the after-effects of hir rampage. Physical shock was taking its toll and, with the re-assertion of hir normal rational self, the enormity of what shi had done was hurting hir. I led Malena over to Goldfur, saying, "Come, Goldfur needs us badly now." We took our place beside hir as shi started sobbing in reaction. We were all holding hir and stroking hir fur in an effort to allay hir pain when the other foxtaurs started arriving. Foxtaur paramedics took over from Kris and called in their aerial rescue unit. The town could only afford a small helicopter and one patient was all they could take, so they decided that Goldfur should be carried out on a stretcher. But before either left the scene, two more foxtaurs arrived. One was male, the other female, but they were similarly clad in a distinctive uniform. The vixen was late middle-aged with silver fur lacing her coat. The tod was burly and alert. The other foxtaurs were respectful of them as they looked around without hindering anyone. They started asking questions of everyone and I turned to Rikandor and wordlessly indicated them, asking for clarification. Quietly, Rikandor explained; "They are Justice and Enforcement. Those two have the honor and duty to investigate incidents that affect the whole village, determine culpability and exact punishment. While the village must conform to the laws of this country, within the village, we do not have a legal system but a justice system. These people have been chosen as the most honest, just and competent foxtaurs in the village and they have first and final authority here. Don't be afraid of them. Just answer all their questions fully." I admit that their investigation was thorough. They took nothing at face value and sought verification wherever possible. They took a good look at Ketta before she was air-lifted to the helicopter. When it came our turn to be questioned, I explained that Goldfur was not in any condition to answer questions at this time, then repeated my explanation about my sister's actions. They seemed satisfied, although they did say that they would follow up when Goldfur had recovered. I felt strangely awed by their presence and was glad when they were finished. We were able to get Goldfur out of the forest fairly quickly because the trail was a well-traveled route and therefore properly maintained. Shi was taken to the med center and treated for shock and exhaustion. Shi continued to hold Eudora very possessively and I warned the doctors not to even think about trying to get hir to release the cub into their care at this time. Garrek refused to leave his mate's side and Malena wanted to stay too, but the medical personnel would only allow one person to stay with hir continuously. They would allow Malena to stay only a little longer and then she would have to leave and come back later. I, too, wanted to stay with my sister, but I deferred to Garrek. I knew that despite all that happened today, Goldfur would be all right. Malena excused herself, saying that she wanted to attend to a personal errand while she had the chance. I wanted to get back to the house where I'd left my cubs in Jaleth's care. Rikandor had already left to give his mate all the news. Kris and Trina accompanied me while Midnight chose to go back to the games. Shi had urged me to join hir to get myself out of the somber mood that I was in. Remembering the incident last year and the way that I got myself stuck in a rut of self-pity, I had to agree that shi might have the right idea. When we got back to the house, we found Quickpaw and Miktar there. They had heard about the kidnapping, as indeed so had most of the community by now. They had come back here to get more information and we all told what we knew. Apparently the games had pretty much come to a halt and the village was buzzing with speculation. I reckoned that it was time for all of us to make an appearance to let everyone know the situation and to settle rumors. Firstly though, I attended to my cubs needs. Quickpaw pointed out that Eudora's needs could not be fully attended while Goldfur refused to let hir go, so shi and I went back to the med center when I was done. Goldfur was asleep when we got there, Garrek tenderly stroking hir hair. Eudora had started squirming though, tired of being confined within hir mother's grasp. Malena rejoined us just as the cub woke my sister. Quickpaw took the opportunity to step forward and authoritatively demanded that Goldfur let hir take over Eudora's care while Goldfur recovered hir strength. Goldfur smiled tenderly at our little sister who acted so grown-up. "Yes, sir!" shi replied. Even so, shi was still a trifle hesitant to pass the cub over, but finally did let hir go. "Please don't let hir out of your sight for even a moment." "You know I won't, so relax and rest," Quickpaw reassured hir, then left for the house. It was then Malena's turn to do some insisting, claiming that it was her turn to stay with Goldfur for a while. Garrek was understandably reluctant, but relented after I pointed out that as a co-mate, she had as much right as he did to attend to Goldfur. Malena said, "Stop worrying so much, brother. Our mate is strong and just needs hir spirits restored, and I have some news that may help do that." She put her arm about Goldfur and looked hir in the eye and said, "Goldfur, my darling, I am pregnant." Goldfur wasn't the only one to feel startled, but shi was the one to ask the question that we all wanted to ask. "So soon? How could you possibly be sure of that? You don't even have a chakat's inner sense and we don't know until about a day later." "True, but I didn't rely on that. I've just been to see the medics and their equipment is excellent. Their scanners were able to detect a fertilized egg, so I'm quite sure that you have successfully sired the cub I wanted so much." "That we wanted, Malena. Oh, my beautiful vixen, that's such wonderful news." Goldfur's eyes were brimming with tears of joy. Shi embraced Malena with fervor and Garrek joined with them in congratulations. When they finally let each other go, Goldfur's tears were freely flowing, bringing hir the catharsis shi needed. I thought to myself, "Good on you, Malena, that was a beautiful idea to confirm your pregnancy and let Goldfur know." I was determined to find some way of rewarding her for thoughtful deed. Just then, a nurse came in and demanded to know why we were crowding the ward again. She shooed out most of us, leaving just Malena to attend to her mate. Garrek was a far happier foxtaur now that he was sure that Goldfur was going to be fine, and I certainly had my own spirits lifted also. We paused outside Ketta's ward to inquire about her status. The doctor informed us that although she was still unconscious, there wasn't any major injury and they expected her to awaken soon. This was a relief to all of us as we neither wanted any more strain put on Goldfur, nor wished Ketta any ill will despite her actions. The rest of the day turned out to be almost normal. Midnight was able to get to the archery competition in time. Dilenna had insisted on holding it up until Midnight came back and, since she still was doing the organizing for the event, she got her way. Both had been practicing their skills since last year and it was obvious that it was going to be narrowed down to those two again this year. Once more, it came down to a play-off, but this time all the arrows of both competitors thudded home in the bull's-eye. I was wondering whether they would have to come up with some extraordinary means of determining a winner when Dilenna called for the crowd's attention. "I declare this competition to be a draw! As any more extreme test would start relying on luck as much as talent, I think that it's only fair that Midnight's skill be acknowledged as matching mine. Congratulations, Midnight!" I was impressed by the fact that these foxtaurs all responded with enthusiastic cheering. These weren't games where it was a case of win at all costs. No, they enjoyed the spirit of competition far more than most, and they had seen some wonderful archery demonstrated today. As the crowd raised its voice in approval, Midnight went over to hug her friend. Neither cared that there wasn't a clear winner. They both enjoyed the sport for its own sake and the two had become fast friends because of it. I still wasn't sure that I was in the mood to compete in the games myself, but various foxtaurs began coming around to ask me to join in various events. I ended up relenting and found that I did enjoy myself after all. One event that I had already promised to re-contest was the cross-country race. As always, the cubs had set up a different, but equally tortuous route. The little blighters even managed to dunk me again! I had a harder time beating the competition this year, but I still managed to retain my title. The foxtaurs whom I narrowly defeated swore that they'd get me next year, then dragged me away to buy me a drink to congratulate me. Last year, due to the loss of the little foxtaur cub, I never found out what they did after the games. Thankfully, there were no formalities. The various sports finished up and both the winners and losers headed for the refreshment stalls. Then they broke into groups that settled in for long talks or singing or joke-telling. It seemed even the most hotly-contested sporting events were partly an excuse just to get together and socialize. Garrek stayed for a while, but started getting fidgety. I knew that he wanted to get back to Goldfur but didn't want to be seeming to impose on his sister's right to spend time with hir. I got up and walked over to him. "Come on, Red," I said, putting my hand on his shoulder to get his attention. "I want to see how my sister is doing and I think you should come with me." Garrek smiled his gratitude. This gave him the excuse he needed to go to the med center. We found Goldfur and Malena engaged in some quiet talk. My sister looked quite relaxed and happier now that shi had rested for several hours. Hir chakat physiology had already enabled hir body to recover completely and the attentions of hir mates had soothed hir soul. "Oh, Forest!" shi said when shi spotted me. "Tell Malena that it really is okay for me to leave the med center now." "Are you sure that you have recovered sufficiently?" "Of course I'm sure, but my over-protective mate here thinks that I should stay overnight." Malena was a little indignant. "I'm not over-protective. You've had an awfully hard day. I don't think it's unreasonable to rest up a bit more." "Normally you would be right," I concurred, "But we recover very quickly. I think that the best medicine would be for you and Garrek to take Goldfur home and have a quiet night in your den together." "Perhaps shi could spare a few minutes with us first?" The quiet but authoratative voice came from behind us. The duo identified as Justice and Enforcement stood there. The vixen continued, "If Goldfur has recovered hir strength, we require a short time to answer our questions, then shi may go with you." Shi looked at Goldfur questioningly. Goldfur answered, "I'm prepared to answer your questions now." "Good. The rest of you will please wait outside while we talk with hir." We trooped out into the hall and the quiet male of the duo closed the door behind us. My hearing could still make out some of what they were saying, but it was mostly my sister doing the talking. After about a quarter of an hour, the door opened and the two left, bidding us a good evening. We went inside to see that Goldfur looked thoughtful but unperturbed. "What did they ask?" demanded Malena. Goldfur stirred hirself from hir introspection. "Hmmm? Oh. They asked me to tell the whole incident in my own words. Then they sought corroboration of a few events preceding it. There was no sense of interrogation about it, yet I still felt awed in their presence. I felt that they could detect a lie no matter how convincing it sounded. If I forgot to mention a point, they were on it right away. It was quite a remarkable experience." Garrek spoke up, saying, "That is the nature of their office. We choose the best candidates for the jobs. Whilst they are wearing their uniforms, they may command instant compliance with any edict they issue, but this power is balanced by wisdom. They virtually embody the will of the village and the power of the position is almost tangible." "But did they say anything about how you stood?" Malena asked. Goldfur looked a little puzzled. "No, and yet they've left me with the impression that there isn't anything to worry about. We'll find out tomorrow anyway. I've been asked to be present at their office at 10:00am tomorrow." It seemed that there wasn't anything more to be learned tonight, so Goldfur signed hirself out and we all headed home. Jaleth welcomed us at the door. "I was hoping that you'd be home tonight. I have supper ready for you all. Are you quite all right now, Goldfur dear?" "I'm fine, Jaleth. Stop fussing, please." "But I feel so responsible. If I hadn't left your cub alone..."
Goldfur cut her off. "No Jaleth, don't blame yourself. Ketta merely took advantage of the fact that there are no locks on any foxtaur home. It could have just as easily have been Quickpaw or Forest who was looking after hir at the time, or even me. You can't be watching a cub every waking moment and I know how much you love your grand-daughter so I'm sure that you aren't neglectful." Jaleth smiled her thanks for the forgiveness. "Are you sure that I can't get you something?" "Well, now that you mention it, I'm dying for a mug of tea!" "That I can manage," Jaleth said, hir jaw dropping in a grin. Supper was a fairly relaxed affair. We settled in for some comfortable conversation for a while before sending the youngsters to bed. We soon followed suit as we were all tired from the day's events. My sister and hir two mates retired to Malena's room where they would spend a quiet night together. I watched Malena depart with some degree of frustration. I was still at the height of male phase and I had been looking forward to spending some time with the pretty vixen, but various events had conspired to make me miss out for two nights in a row. I sighed. I couldn't even seek another chakat partner because Midnight had told me shi would like to spend a bit more time with Dilenna and would be staying the night at her place if I didn't mind, so of course I told hir to enjoy hirself. Then I chided myself; "Stop being so selfish. You've got two wonderful lifemates waiting for you." I made my way to the other sleeping den and practically straight into the arms of my loved ones. They had sensed my need and were ready and willing to do something about it. That night proved to be very pleasant indeed. After breakfast the next morning, we all started making our way to the village again. The festival was officially over and many visitors had returned to their own towns. However, there were still quite a few remaining a bit longer and several stalls were still catering to those who hadn't found the time to browse through them earlier. Midnight met us on the way and came over to me to give me a welcoming kiss. After replying in kind, I asked, "So, are we going to have to expect yet another cub?" Shi grinned before replying, "No. Dilenna is an independent vixen and doesn't want to be tied down with a cub as yet, and I'm certainly happy enough with the two that I have already. I admit though, it was an enjoyable night." We had a bit of time to kill and Goldfur was delighted to find that the volleyball players were back. They welcomed us and said that they wanted to finish the game that had been so unpleasantly interrupted. After that, the minutes flew quickly by and we had to excuse ourselves in what seemed almost no time. All of us went to the village's central edifice, the one island of high-tech in the nature-loving village that housed the medical center, communications and administration amongst other things. We found the office of Justice and Enforcement and joined several other people waiting to see the two arbiters of village law. Right at the appointed time, the foxtaur duo stepped out of an adjoining office. They squatted behind a desk and got straight to business. As usual, it was the vixen who did the speaking. "This meeting is to announce the findings of our investigation into the recent incident. In summary, the vixen Ketta is accused of kidnapping with malicious intent, the child of Garrek and Goldfur. 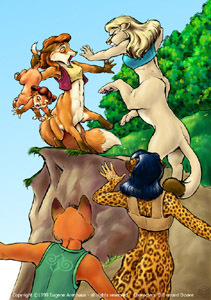 Chakat Goldfur subsequently assaulted Ketta in order to retrieve hir cub. Some people have raised the question of Goldfur's state of mind in this matter, but we have dismissed this as irrelevant in this case. We have found Goldfur's actions justifiable irrespective of hir mental state at the time and no further action will be pursued against hir." We breathed a collective sigh of relief at this, but we weren't given time to start discussing it because the verdict wasn't completed yet. "We have also found that Ketta guilty of kidnapping and assault. Additional claims have been laid by various community members of harassment and incitement to hatred. These claims have been upheld. However, as Ketta is still insufficiently fit to answer questions, the degree of culpability has yet to be determined and the punishment will be decreed later. Are there any questions?" "Does this mean that Ketta is now awake?" Goldfur asked. "Yes, she recovered consciousness early this morning. The doctors have determined that aside from some slight scarring, she will make a full recovery." Goldfur was noticeably relieved to hear that. "So that's it? No calling of witnesses or arguing lawyers?" I queried. For the first time, I saw them both give a hint of a smile. The vixen replied, "You are obviously not used to the way we do things, but we don't use a complex legal system here. We have only one lawyer, and she deals strictly with matters between this community and the rest of country. It is our responsibility to make judgements and our word is final. We are only answerable to the community as a whole. Despite the fact that Ketta hasn't talked to us yet, her guilt is undeniable. The only thing that she can do is try to influence the degree of punishment that we will determine for her. Justice is always swift and fair here." "Thank you, I understand now." I rather liked this system, although it did mean that the community had to make a sound choice of people for the job. It seemed that they had got it right with these two anyway. As there weren't any more questions, the meeting was declared closed. I got a bit of a shock then. The two took off their uniforms and it was as if two new people were in the room. The vixen was wearing a beautiful leather halter similar to my own whilst the tod replaced his uniform with a smart vest. The biggest change though was that their serious and awe-inspiring demeanor was replaced with two normal friendly personalities. The vixen noticed my surprise and came over to me. "You look a little shocked. What's wrong?" I explained my observations and she started laughing. "That is part of taking on the role of Justice and Enforcement. It is something that we are fortunately only called upon to do occasionally. The rest of the time we live pretty normal lives. Oh, I should introduce myself properly. I am Purteshka the Leather-worker." Another surprise! I started almost babbling; "I'm so pleased to meet you finally. I've picked up several of the items that you made for my mate and cubs, and myself of course." "Yes, I recognized my handiwork. I'm pleased that you like them." "Oh yes, I do a lot. So you do leather-working for a living and this is only an occasional thing?" "That's right. Neither my partner Ballarn nor myself get paid for this. It is a position of honor and prestige but otherwise we don't earn anything for doing our duty to the community. That means that I had better get back to my real work. You're welcome to drop by my workshop later if you wish." I assured her that I would be delighted to do so, and then she departed after giving me directions. My family decided to find a tavern or coffee shop and celebrate. The rest of the day was enjoyable, but unremarkable. We had a magnificent celebratory dinner that night and we toasted Goldfur and Malena with good wishes for their cub. Later Malena came over to have a word with me privately. Almost shyly, Malena said, "You know, I could have ended up choosing to ask you to mate with me. A year ago, I found you both very attractive. I had to choose one of you then and I picked Goldfur because you had just mated with Midnight. As it turned out, I still got to make love with you and I have always treasured that. I'd like to renew that memory tonight, if you will have me." I thought to myself, "All good things come to those who wait." To Malena, I replied, "I'd be delighted and honored for the chance. And one more thing, if I didn't have three wonderful mates already, Goldfur would have some stiff competition." Malena laughed and threw her arms about me and gave me a joyous hug. I replied in kind and gave her a lick-kiss on the muzzle. Tonight was looking like it would be a lot of fun! NOTE: There is a love scene between Forestwalker and Malena that I decided to take out of the main text because I felt that it was pretty much gratuitous and didn't significantly further the story. However, for the sake of completeness and for those who like love scenes, you can read about it in the Forest & Malena Love-making supplement. To be continued in A Forest Tale 11: Lessons.